I know I don’t post on here that much, I guess because these days just about the only social media thing I bother with is Twitter and my Morning Sheep Time periscopes, but I thought it’d be cool to do an update talking about some of what we have been up to since Polybius came out. 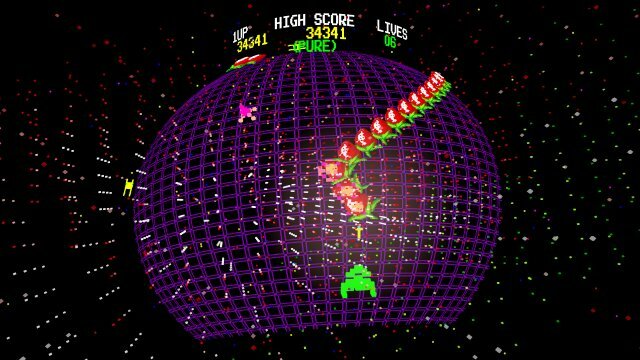 Of course we’ve completed the ports of Tempest 4000, which is finally out on PC, PS4 and Xbox One. 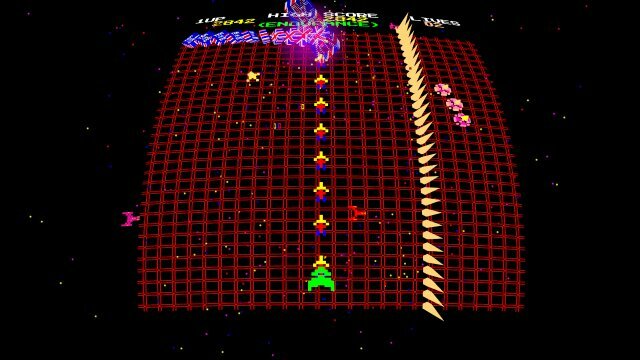 And having finally finished that we’re working to put final touches to two projects that have been nearly complete for a few months now – Polybius for PC/Oculus Rift, and Minotaur Arcade Vol. 1. Both things are nigh on complete and just await final plumbing in to the Steam online leaderboards/achievements stuff and that will be happening over the next few weeks. We do have MAv1 also working on PS4/PSVR but the Steam version is likely to be first out as it won’t have to pass through the release bureaucracy at Sony. 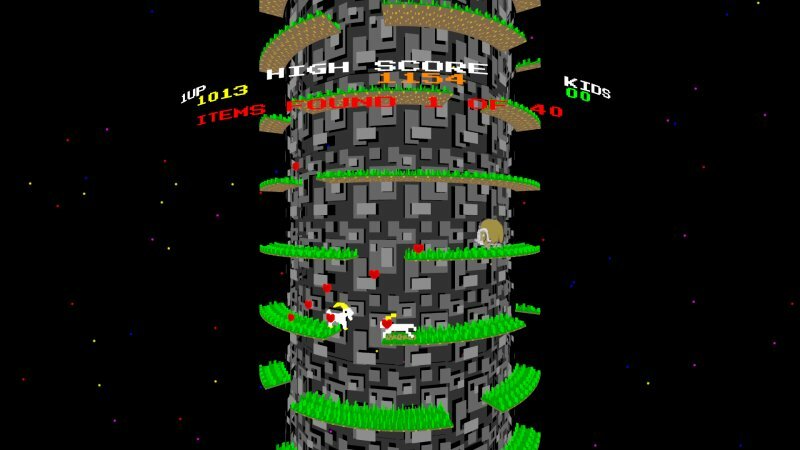 Just in case anyone is wondering what Minotaur Arcade is and how it relates to the old Minotaur Project mobile phone games, well, I shall explain. The Minotaur Project games were a series of 9 games I did during the two awful years I worked on mobile phone games. Although those two years ended up being the worst of my entire career, the games themselves werre actually pretty decent little things, and garnered good reviews wherever such things were published. Over time the games became nonviable on iOS as Apple decided that nobody would be able to run older games on newer versions of their OS, and we had neither the hardware nor the inclination to invest any more time in updating them, and anyway I had no intent of going back to mobile at all any time soon unless someone was to pay me handsomely in advance to do so. Just too horrible of a market. Some of the games were ported to Android, and indeed free versions of those are available elsewhere on this site. But basically those games were languishing and pretty much unavailable to most people. At the beginning of the year Giles was working on the Tempest ports, and I was in need of something to do myself, and I thought it might be nice to somehow maybe resurrect some of those old mobile games, rescue them and bring them to actually viable platforms. Of course I didn’t think that just straight porting them over would cut the mustard; I’d have to be able to make them more interesting in some way and polish up and extend them. 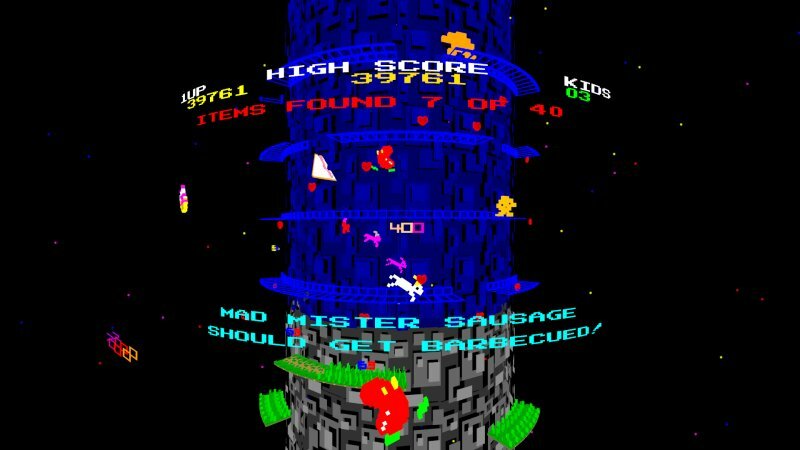 One of my favourites of the old Minotaur games was Gridrunner, which I’d developed in the style of a classic old Namco arcade machine. Now most old arcade machines were sprite and tile based, and so was a lot of the old Minotaur Project stuff, so I started thinking about how I might go about creating some kind of framework into which it would be easy to port sprite and tile based stuff, making it easy for me to plug the old MP designs into it, whilst also allowing for the possibility of introducing new features with which to extend the designs once ported, and to make them look nicer and more interesting than just straight mobile phone game ports. I thought it’d even be nice if I could make it so everything could be playable and look cool in VR as well as on a normal monitor, since by now we have a fair bit of VR experience and the necessary bits in our engine, so why not? 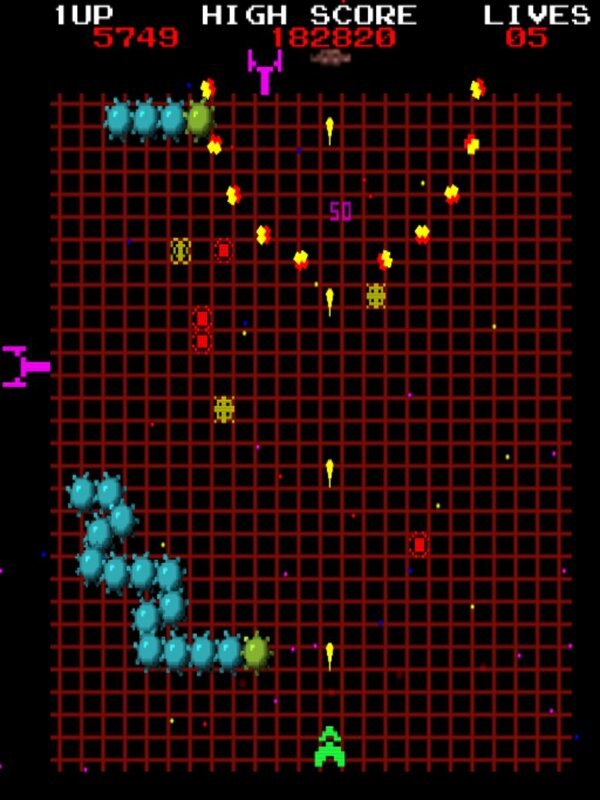 And so the framework for Minotaur Arcade was made – a ‘virtual arcade game’ environment designed to be easy to port MP games into (and therefore by their very nature *any* sprite and tile based games also), which would allow me to get ports up and running relatively quickly, then allow me to add extra stuff to make them more interesting and fun. And have playable VR versions fall out by default too. I don’t have that many screenshots of the actual porting process unfortunately but there are a few taken during porting of Goatup so you can see something of how it works. Here’s Goatup on iOS. 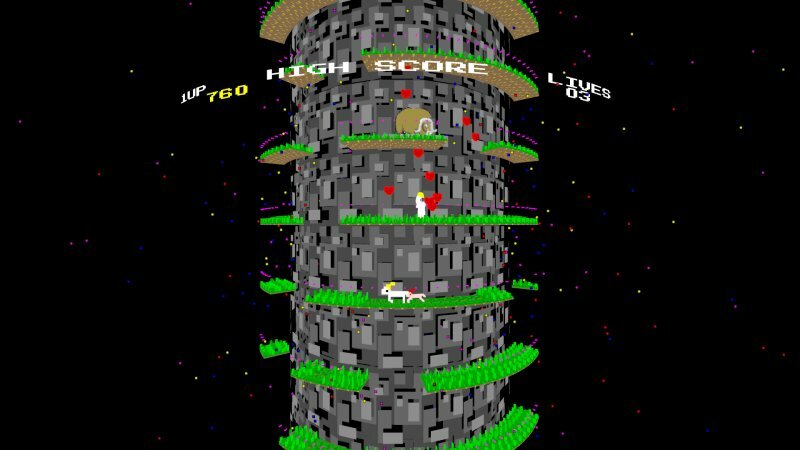 It’s a platform game where you have to climb up as high as possible while eating grass, grabbing bonuses and having kids. As you can see it’s not particularly complicated; there’s a bit of an effect to make it look like it’s mapped onto a section of a cylinder but it’s really pretty minimal, you can barely notice it in the screenshot. And here we are at the start of the porting. 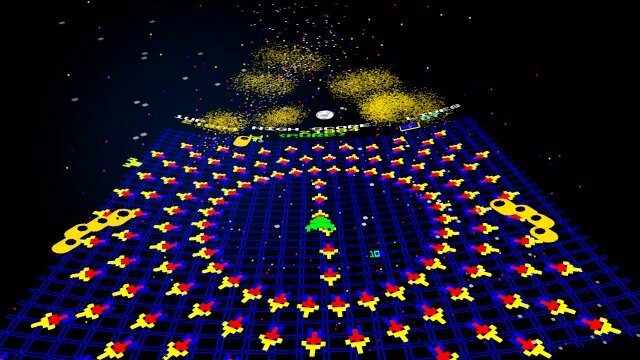 The sprites and tiles have been recreated in a voxel editor, as everything on the “virtual arcade game” screen is a voxel object. To the code we’re porting our environment just looks like a char map and some sprites though, so it’s easy to quickly start getting bits of the game logic ported and working even if they don’t look that nice yet. 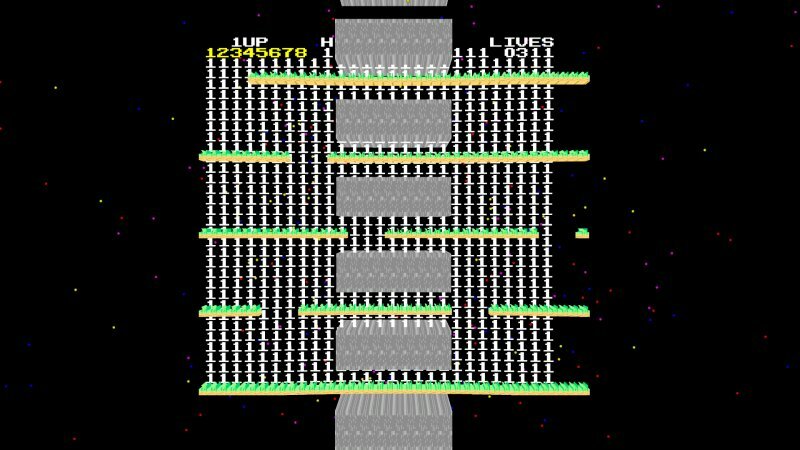 You can see the platform generation is working and the central column is sort of being drawn even though it looks a bit odd. The Spectrum-style score display of the original is now replaced by our Namco-coinop-style status area at the top. A bit further on. The “screen” doesn’t have to be flat any more since it’s a 3D object in its own right, so instead of simulating the game being drawn on a section of a cylinder, we can simply actually make it so. It’s looking a bit sparse and odd here but you can see that major bits of the game are actually starting to work and become playable. The goat is running around eating grass and leading kids around already. And here the basic port is nearly complete. There’s still a few inconsistencies (like it saying ‘lives’ in the top right instead of ‘kids’), but it’s pretty much all working. It looks more interesting than the old mobile versions, it’s fully playable in VR as well, but as far as the game logic is concerned it’s just running on a stock sprite and tile system. It means we can get a nice looking port done really quickly. Once done we can polish up the game and add extras as necessary. The end results look pretty nice compared to the original starting point. Of course we would like to be able to sell these games, and hopefully to be able to do so at a reasonable price, as we’ve learned through bitter experience that the ‘race to the bottom’ pricing of games on mobile led to them becoming devalued to the point where charging over a pound was considered to be “expensive” and it’s now at a point where people on mobile simply expect games to be free and developers have to resort to trickery like serving adverts or designing games that funnel users through IAP pay bottlenecks as part of their core design. This is not something I am willing to resort to. Ideally we’d like to charge perhaps a bit over a fiver for MA releases. I do appreciate that some people might think that a little cheeky for enhanced mobile phone game ports even if they are quite significantly enhanced (but I would argue less cheeky than selling emulator roms of old games for that kind of price, which seems to happen a lot on various platforms these days). So I figured to make the perceived value better it might be nice to organise the MA releases as pairs of games – hence the “Volume 1″. I figure two decent games, including VR versions, for a bit over a fiver isn’t that bad of a deal. 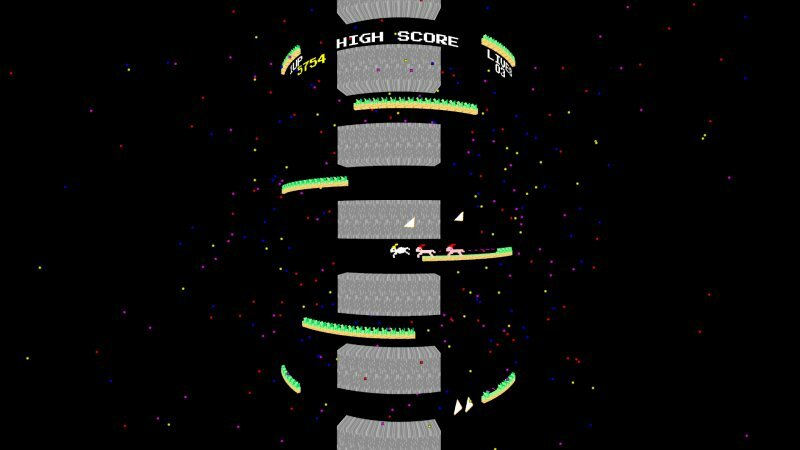 The other game of the first pair is Gridrunner, as you have no doubt figured out by now. 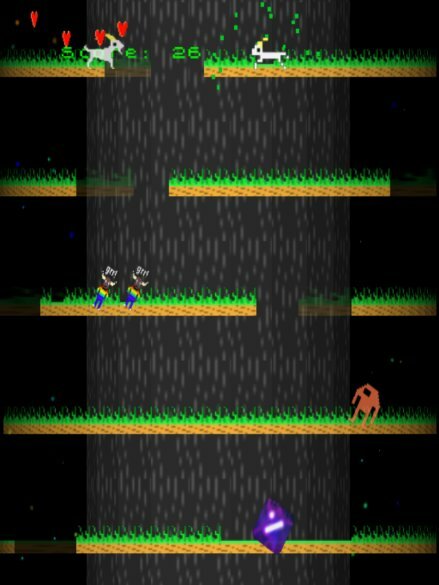 Here are some screenshots of what it looked like on iOS, and what it looks like inside the Minotaur Arcade environment. 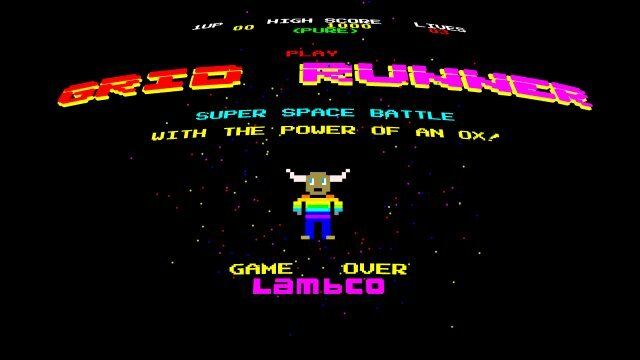 Gridrunner ported to Minotaur Arcade. Here is the title screen of the attract mode. 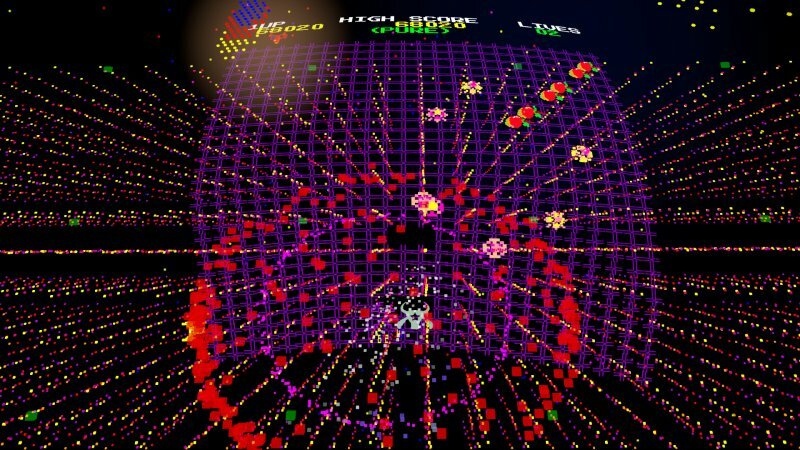 Gameplay from an early level. Logically the game thinks it’s on a flat tile map. 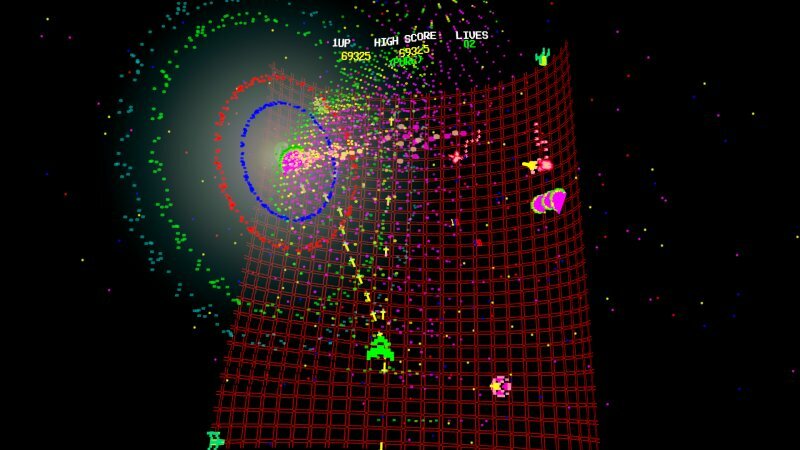 We can use the Minotaur Arcade framework to warp it onto a hemisphere though, so why not. 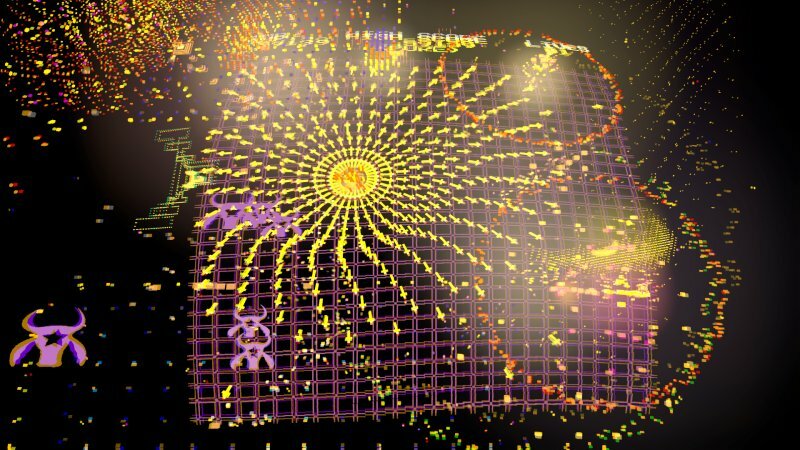 The display of the “virtual arcade machine” isn’t constrained to the tilemap surface, so explosions can happen in 3D space. Something you will appreciate even more if you put on a VR headset and get inside the display! Different levels can offer different perspectives and topographies. and here, where you’ve just completed a level, so we can go a bit bananas with the voxelshatter and postprocessing effects just to punctuate that pleasurable moment of completion. 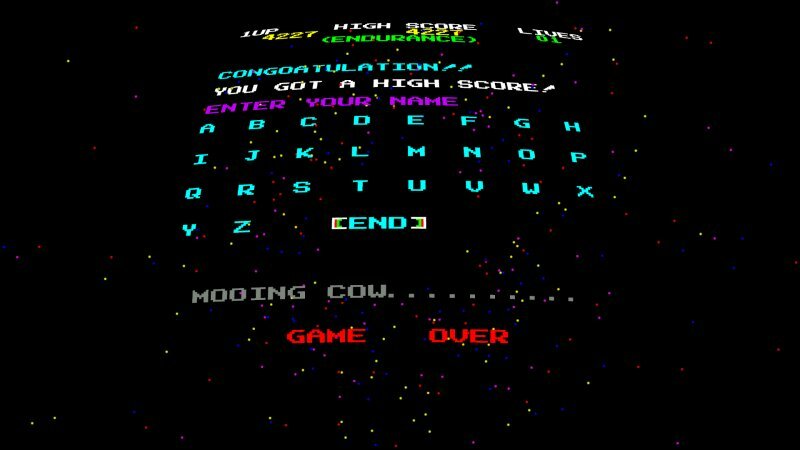 The games come with all the usual Llamasoft modes you’ve come to expect – Gridrunner has Pure, Endurance and classic Restart Best modes, for example, with online and local score tables for each. The games now also have a new mode called Arcade Mode. This only affects the score table behaviour. Basically on completion of a game, instead of entering your login name automatically as would normally happen, in Arcade Mode when you get a hiscore it brings up an oldschool arcade-style name entry board into which you can enter whatever you like. This entry is then saved on the local (but not online) score table. You might find this mode handy if you have a bunch of mates round, for example, and you want to take turns competing for hiscores, just like in the old arcades, without requiring each participating player to log into Steam or whatever. Well there you go, that’s what Minotaur Arcade is about. We’ll see how it goes releasing this on ps4 and Steam, and if it goes well enough to warrant it there could be ports to other VR platforms, and further Volumes. It’d be nice if it does do well enough to justify further developments, as I’d enjoy not only porting other Minotaur Project games, but perhaps also doing modern updates of some of my other sprite-and-tile based games (just about anything from the c64 and 16-bit eras would fit well). Or even develop new content for it as well, since I’m not about to just be rehashing old stuff even if I do considerably enhance it. And it beats selling straight MAME roms for nearly a tenner apiece IMO. I’ll finish off with a video of MAv1 running on ps4. Look out for it soon, probably on Steam/Oculus first and ps4/psvr subsequently. This entry was posted in Grunting, New Releases. Bookmark the permalink.